Coleytown Elementary School is slated to add three portable classroomsl for next year in order to accomodate the sixth graders who will stay at the elementary school in light of the closing of Coleytown Middle School. WESTPORT — The Representative Town Meeting voted 28-3 Thursday night to appropriate $1 million to fund portable classrooms at Bedford Middle School next year. 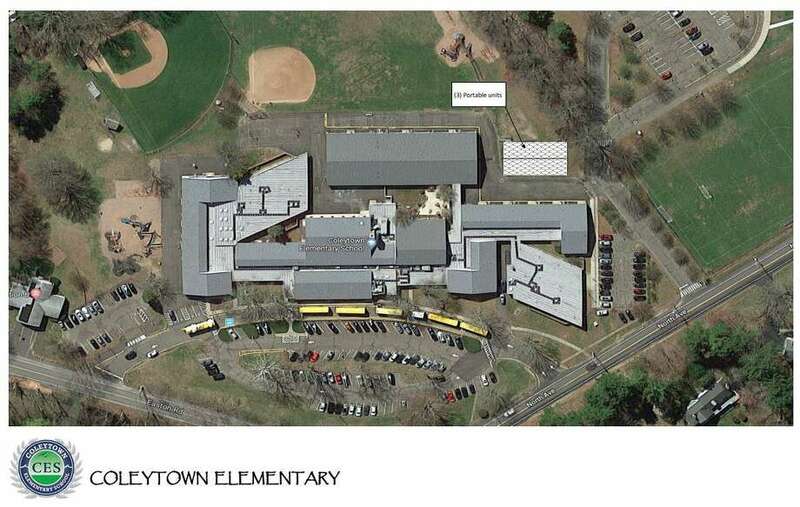 This followed an impassioned discussion in which residents appeared divided on how to configure town’s schools until Coleytown Middle School reopens, hopefully in the fall of 2020 according to recent reports. The RTM’s decision comes on the heels of the Board of Finance’s Wednesday night vote to reject a $4 million request from the Board of Education for 14 portables to be housed at the elementary schools as part of the K-6 plan. Under the plan, all the town’s incoming sixth-graders would have stayed at the elementary schools next year, and all seventh and eighth-grade students were to attend Westport’s sole remaining junior high, Bedford Middle School. Instead, the Board of Finance voted to amend the $4 million request to $1 million for portables at Bedford, effectively killing the K-6 option and implementing a plan in which all town’s middle school students will attend Bedford next year. However, many parents questioned the decision to switch plans, arguing it was not in their purview to go reverse the K-6 plan recommended by Superintedent of Schools Colleen Palmer and the Board of Education. “As to where our students should be housed next year, there has been a comprehensive process that should not be overruled. ... The middle school is already crowded,” resident Becky Martin said, noting the Community Advisory Committee recommended the K-6 plan and said the 6-8 plan was not a good option for the town. All of town’s middle school students have attended Bedford since Coleytown closed due to mold issues in September. The BOE approved the K-6 plan in December. But in the months since, it was revealed it would cost a projected $3.6 million for 14 portables for five years, far more than the BOE expected when it approved the plan. On Monday, the BOE reaffirmed its commitment to the K-6 plan in a 4-3 vote. RTM member Amy Kaplan agreed the RTM should not overturn the education board’s recommendation. “Now is not the time to be nickel and diming the plans that our educators have deemed is the best course for the education, social, and mental well-being of our students,” Kaplan said. Kaplan and fellow RTM members Mark Friedman and Arline Gertzoff favored the K-6 plan and were the three representatives to vote against the $1 million appropriation for portables at Bedford. Speaking through tears, parent Rachel Cohn said she fears sending her current fifth-grader to a large, combined Coleytown and Bedford middle school next year. “How will this school prevent kids from getting lost in the crowd? How will we foster nurturing relationships with teachers in small group environments? How we will we prevent anonymity and the anxiety and other social and emotional outcomes that this can cause? Bullying, vaping, sexual harassment, sexual assault, drugs, and every undesirable behavior that one can think of. In an overcrowded environment, how will these be known of, shone a light on, and addressed,” Cohn said. Several RTM members also expressed concern about the number of students who would be at Bedford under the 6-8 plan. “The K-6 model is far less disruptive on a daily basis and an hourly basis. ... As they transfer out of classes, we’re talking about 1,300 roaming the hallways. My analogy is LaGuardia airport,” Friedman said. Other parents advocated in favor of the 6-8 plan at Bedford, citing the need to focus energy and resources on reoccupying Coleytown and not getting bogged down in the complexities of planning for the K-6 model. “I still hate the monster school. It’s not great for this town, but what I hate more is inaction and distraction on Coley middle school. ... That is the thing that will unite this community: when we have a proud second middle school opening,” Robert Harrington said. RTM member Lauren Karpf said the strategic choice for the town and students is to focus on rebuilding Coleytown. “It makes no sense to me that we would throw our entire system up in the air and create such upheaval solely for the short-term, interim period,” Karpf said. Both RTM members Jack Klinge and Kristin Schneeman said the town should stick to the simpler 6-8 solution to avoid any unintended consequences from the K-6 plan. “Keeping sixth through eight at BMS is the far simpler solution that can be more easily unwound after a year or two, preserves not only the curriculum with the enabling infrastructure in place, but the amazing extracurriculars that make middle school so special in this town,” Schneeman said. The K-6 plan is “too much chaos and disruption” given the school administration’s information that the portables would only arrive a few weeks before the start of next school year, and only if all the planning runs on a perfect timeline, RTM member Lois Schine said. Wendy Batteau, who represents the Coleytown area for District 8, said the town needs to fix Coleytown in order to stop the decline in property values in her neighborhood. Christine Miers Schatz, RTM district 2, said she is concerned if the portables do not arrive on time under the K-6 plan, the town will have to default to the 6-8 model and will not have time to prepare the school. It’s better to choose the 6-8 plan now and begin preparation to mitigate concerns about housing all middle school students at BMS, Miers Schatz said. Athena McAlenney, a Westport parent who works as an associate professor of education at St. Thomas Aquinas College, also noted many of the concerns parents have about the social and emotional risks of a large middle school can be remediated with proper planning by school administrators and faculty.